Each year, thousands of people around the world celebrate the remarkable contributions GIS technology is making in our lives; this celebration is called GIS Day and will be held Wednesday, November 19, 2008. Since 1999, GIS Day has created a venue for GIS users to share, inside and outside their organizations, why GIS and geographic knowledge are essential in our daily lives. Through GIS Day, GIS users encourage new ways of thinking using spatial analysis, promote the importance of geographic awareness, and create a positive change in our world with GIS. Map galleries, GIS demonstrations, and community service projectsGIS Day takes on many forms, but the wealth of GIS knowledge and education is apparent with each event. GIS Day hosts and attendees collectively benefit from GIS Day. Learn why you should join others in celebrating GIS Day. Stantec Consulting Inc.'s San Diego office's 2007 GIS Day event combined the beautiful ambiance of a local brewery's gardens with a collection of booths demonstrating various GIS applications. GIS Day, a Tradition at Stantec Consulting Inc.Stantec Consulting Inc. is no stranger to GIS Day; several of its U.S. offices have held successful GIS Day events in years past. "By the fourth year, we actually had clients calling us to ask to get invited," says Heather Dermyer, GIS manager. "We kind of built up a name for ourselves." 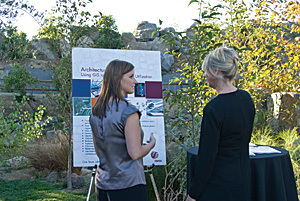 The San Diego, California, office's 2007 event, titled Don't Get Stuck in the Stone Age with Your GIS, combined the beautiful ambience of a local brewery's gardens with a collection of booths demonstrating various GIS applications used in the surveying, public works, transportation, planning, water resources, landscape architecture, and archaeology domains. This educational event was also a great time to reflect on the company's case studies. "The format worked very well," shares Dermyer. "Guests learned something fun and unique in a very informal, casual wayhopefully, they can relate it to what they do and can go back to their office with some new ideas." Libraries of the Claremont CollegesThe collection of research topics discussed at the Libraries of the Claremont Colleges, Claremont, California, 2007 GIS Day event illustrated the vast uses of GIS technology across multiple disciplines. Faculty and staff shared their research and GIS knowledge with others by organizing presentations to show how GIS can be used to understand problems and trends in areas such as geology, psychology, and economics. "We're trying to incorporate GIS as a tool in the classroom without changing anything in the curriculum," says Warren Roberts, Libraries GIS specialist. "This is one way we can get students to understand the point of this tool so they can learn it and apply it in their programs." McMaster University Hosts GIS WorkshopWith the increasing amount of geospatial career opportunities in the workforce, consider GIS Day as a venue to encourage students to achieve a future in GIS. McMaster University, Hamilton, Ontario, Canada, celebrated GIS Day in 2007 by inviting four high schools to attend a daylong GIS workshop. The GIS Day event was part of the school of geography and geology's High School Outreach Program, which raises the visibility of the fields of geography, earth sciences, and geomatics among high school students and their teachers. Hannibal School District Develops GIS CurriculumTeachers from the Hannibal School District, Hannibal, New York, created GIS activities and units to use during the 20072008 school year. From this exercise, a few members of the group decided to support their curriculum work by hosting a GIS Day event to showcase careers related to GIS. A total of eight presenters addressed teachers, board of education members, principals, the superintendent of schools, several visitors from the community, as well as more than 1,000 fifth- through eighth-grade students. In addition, guest speakers from businesses and colleges that implement GIS shared with students how GIS technology is used in real-world situations to manage geographic information and solve problems. The presenters also shared personal stories, maps, PowerPoint presentations, and tools used in their fields. GIS technology, GIS users, and GIS Day are making a difference in our world. Join others in celebrating the 10th annual GIS Day, Wednesday, November 19, 2008. To learn more about GIS Day and to download free materials for your event, visit the GIS Day Web site at www.gisday.com.